Distances below are from Culverdene House as per Google maps. (6 Km from Culverdene House). These trails are suitable for cycling, hiking and snowshoeing. • Waterford Heritage Trail – 20 Km – to Waterford and on to county line. Trails totalling 2.3 km go over a dam and through a forested area providing opportunities for walking/hiking, fishing and nature appreciation. The trail includes some hills and has a natural base with exposed tree roots. Bluff Lookout Trail: A 2.2 km self-guided interpretive trail that explores the effects of man on his environment in the early twentieth century. The trail leads to a bluff overlooking the village of Turkey Point and Long Point Bay. Fin and Feather Trail: This trail takes the visitor through a red pine plantation to the Normandale Fish Culture station. Rainbow Ridge Trail: A 2.4 km self-guided interpretive trail explains the ecology of the park's marsh and woodland. Maintained walking trails guide you through numerous habitats such as dry forested ridge, wet slough, buttonbush swamp and floodplain. The trails are open year-round and are ideal for hiking in spring and fall and cross country skiing in winter. Fishing is a major recreational activity in Norfolk County. Many species can be caught here – walleye, perch, large mouth and small mouth bass, crappie, pike, coho and chinook salmon, brown trout and lake trout. Long Point Bay is a year-round destination. Marinas and fishing charters can be found in Port Dover, Turkey Point, Port Rowan, Long Point and Port Burwell. Port Dover is host to an annual week-long perch derby. 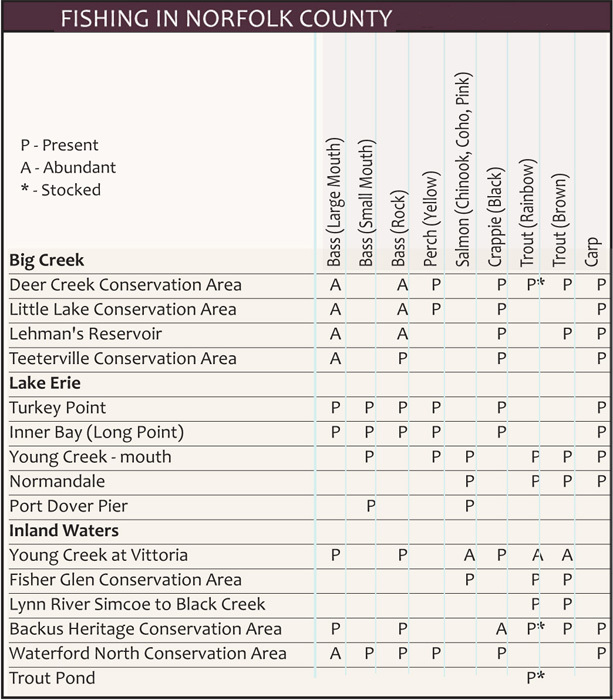 View Fishing in Norfolk County chart.